It’s not often a girl gets to invent her own gelato! 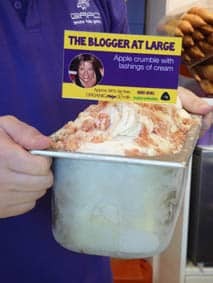 But thanks to the very cool owner of Giapo on Auckland’s Queen Street, the Blogger at Large Apple Crumble with Lashings of Cream gelato was launched to honour our sister travel site BloggeratLarge. Gianpaolo Grazioli is a fair dinkum Italian so he knows a thing or two about making ice cream. He boiled the apples with sugar and cinnamon and added it to a gelato milk base, made a separate cake, then broke the cake into crumbles and added a few bigger pieces of apple into the mix. Oh and being that today is St Patrick’s Day he’d made a Guiness sorbet. Totally tasted like frozen beer. Giapo changes his flavours every week and uses organic and fresh fruit and locally supplied ingredients. No two visits will ever be the same! OMG. I want to try. Looks delicious!